Pierce Brosnan (Mamma Mia!) stars as a former British Prime Minister in Roman Polanski’s critically acclaimed thriller The Ghost Writer. In the film, when a successful British ghostwriter known only as The Ghost, (Ewan McGregor) agrees to complete the memoirs of former British Prime Minister Adam Lang (Brosnan), his agent assures him it's the opportunity of a lifetime. But the project seems doomed from the start-not least because his predecessor on the project, Lang's long-term aide, died in an unfortunate accident. Question: Tell us about your character in The Ghost Writer. 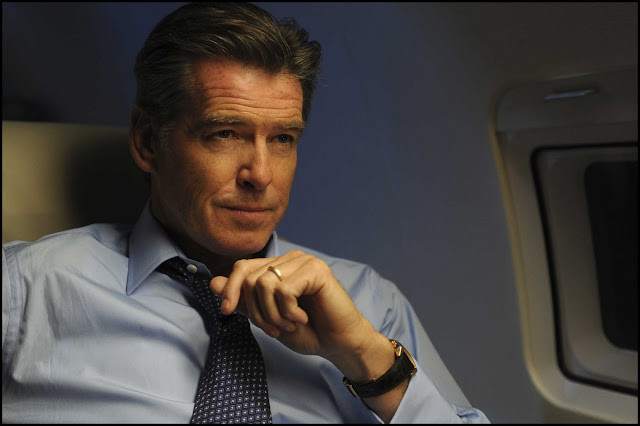 Pierce Brosnan: I play an ex-British prime minister who finds himself, at this time in his life, being held accountable for war crimes. In fact, before that, he’s sequestered away on Cape Cod writing his memoirs. His ghost writer shows up dead on the beach and he employs another ghost writer, and at the same time they do that, the breaking news comes that he is being held accountable for war crimes in the Hague. Q: What drew you to this project? Was it the screenplay, the director, or the story? Brosnan: It was Polanski. And the book “The Ghost” by Robert Harris, which is a great page-turner. Roman is one of cinema’s finest directors and a director of great thrillers, but he’s never done a political thriller. It was the combination of Polanski, the political aspect of this story, the character that I play, this man who finds himself kind of emotionally, politically, spiritually adrift and hunted. Q: A lot of the film seems very relevant, very current, and there are some political themes embedded within the film. What’s the film trying to say specifically? Brosnan: That our leaders should be accountable for their actions in life, and the pitfalls and the dangers of politics. Someone like my character, who’s very much a populist, is this man who you begin to feel is just a puppet of a prime minister. As sincere as he was when he started his career, he now finds himself to be maligned every which turn. Robert Harris has presented this on the pages of his book and then in the hand of someone like Roman Polanski, who’s the grand master of claustrophobic drama and malevolence of characters, it makes for quite a good brew of drama. The book was written three years before any of what’s happening to the life of, say, Mr. Tony Blair right now who is in the spotlight for his term in office, and to the world of Mr. Polanski who is now under house arrest. I think it seems to be a wonderful time for Mr. Robert Harris. I think even he has been blindsided by the compliments of stories and history. Q: In general do you see movies as an opportunity for actors to make political statements? Brosnan: No. This is pure entertainment, this is no statement by me. I’m not a politician or political animal. This is just, as I said, one of these huge “what if” stories. I mean, it will certainly be viewed and talked about, I presume, in political terms. But it’s pure theatrical drama. Q: Can you talk about what it was like for Mr. Polanski to direct you? Brosnan: Working with Roman is a unique experience. He’s someone whose work I’ve been very enthralled by for many many years. His life is so well documented, and certainly he’s a figure on the cinematic landscape that I was very fascinated by. He creates a world that no other director that I know of, of intrigue and foreboding, claustrophobic characters on a landscape. Q: How would you compare him to other directors that you’ve worked with? Brosnan: I think it’s an articulation of the camera, which is uniquely his. The composition of characters. The use of every specific element of cinema. He involves himself with the production design, all the way to having the courage to wait for the weather that he wants on a set. Within the confines of making a movie, which is time and budget, he has the grandiosity to say that we will wait, the cameras won’t roll, and in our particular case we wanted bad weather, and there was one week where we had good weather. Q: The Ghost Writer recently premiered in Berlin and took the Best Director award. What’s it like to see the reception for this film? Brosnan: It was a magnificent night at the Berlinale Film Festival, and to present a film like this to an expectant house of Berliners and cinema aficionados at a festival that’s 60 years old. The only sad thing was the absence of Mr. Roman Polanski. The stage, there was an empty space there for him. It was a brilliant night, nevertheless, and it got very well received. The film will be shown exclusively at Ayala Malls Cinemas (Glorietta 4 and Greenbelt 3) starting Wednesday, August 4.